Little is known about Sykes early life except that he was born in England in 1859. A story often told in Santa Barbara is that Sykes was difficult to dissuade once he had come to a conviction. In the case of his youth, a story is circulated that he had an argument with his father, left England - never to return. As the story is told, young Sykes never spoke to his father again. Apparently Sykes' ire so carried the emerging artist that he traveled as far away from his father as possible...which was Santa Barbara, California. Had this been the only tale of Sykes anger, the moniker "Madman" might not have stuck. However, Sykes mad moments were legendary. It is said that once Sykes became angry with an individual, he never forgot. It was, in a sense, a lifelong grudge. Thus Sykes nickname of "Madman" did not refer to his being crazy, but to his notorious ability to carry a grudge. Perhaps the most notorious tale of Sykes anger had to do with Thomas Edison. Sykes was outraged at the invention of the electric light for use in homes and on the street. Sykes thought that this brash new invention took the romance out of life. For Sykes the electric light took away some of life's cherished mystery. 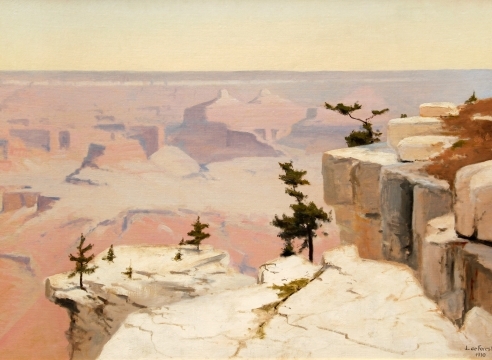 Because of Sykes dispute with Edison, the artist refused to allow electricity to be installed in his home. True to his word, Sykes never allowed electricity to be brought into his house. The current owners of the Sykes' Santa Barbara home speak less than lovingly of the difficulty of having to deal with Sykes not having made provision for wiring, plugs, panels or any form of electricity. 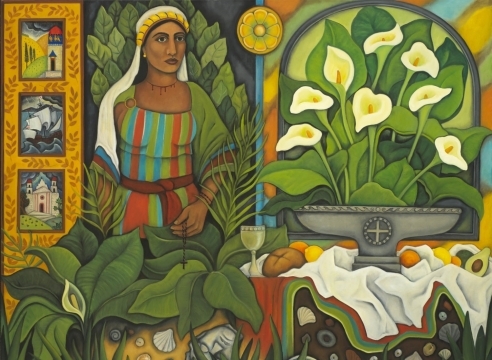 There are only a dozen paintings by Sykes in Santa Barbara's institutional collections. Over the past 20 years Sullivan Goss has seen or shown another 20 or 30 of the artist's works. As a consequence it is very difficult to provide a comprehensive analysis of this artist's work. With that limitation, there are several observations to be made. 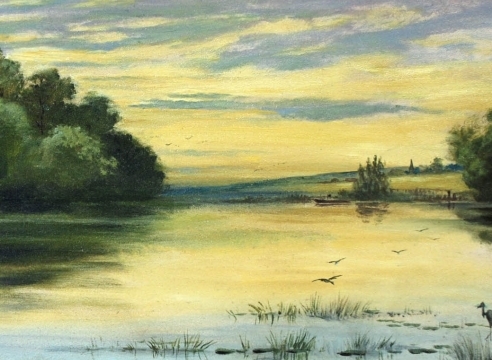 He produced both watercolors and oils. The watercolors are on papers of varying quality: some on professional watercolor paper, others on inferior acidic paper. His oil paintings were similarly prepared: some on high quality European canvas, others on lesser fabrics or boards. One noted oil is on two pieces of cheap burlap that had been stitched together to make a single large canvas. Another 30" x 40" painting was on thin, construction gypsum board. 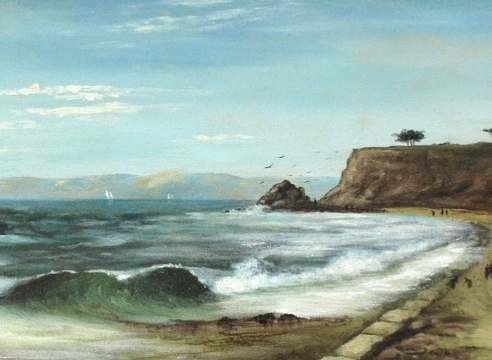 Sykes seems to have been at his best when he worked on small, delicate, tourist views of Santa Barbara's coastline or its Mission. He tended to use a great deal of medium in his oils and often finished his canvases with a heavy coating of protective varnish. Today these two elements combine to give his paintings a dark, yellowish cast. His style was that of a 19th century genre painter. His work is often ponderous and heavy. He, like many painters of his day, would sketch out-of-doors and finish his canvases in his studio. 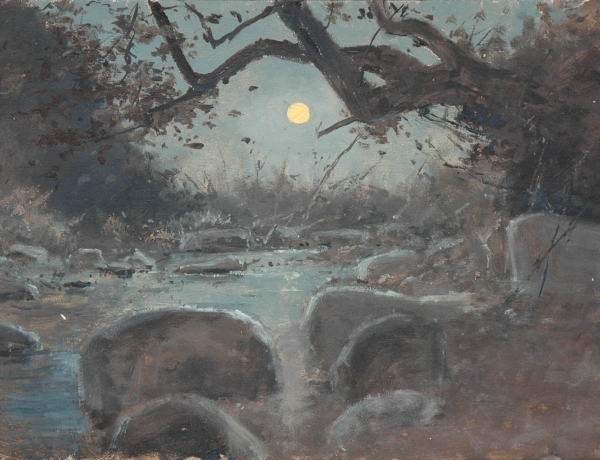 Consequently there is very little sense of sunlight coming from a specific direction in his paintings. Some of his paintings have no shadow at all. 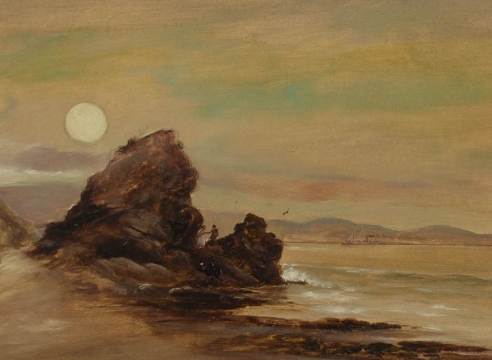 He was known to do lovely views of the Santa Barbara Mission and he occasionally traveled to other California Missions to paint. 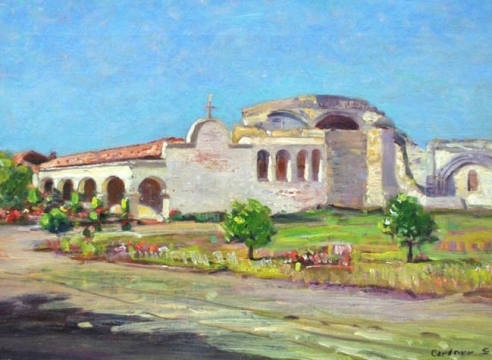 Though uncommon, he would sometimes paint other architectural views of Santa Barbara including the city's aging adobes. When Sykes was at his best, he would include delicate details that artists with better training would omit. Consequently, historians rely on Sykes paintings for the inclusion of historic details which would have been lost otherwise. It should be noted that the quality of Mr. Sykes' work varied substantially. Some work appears hurried and rough, other works are more substantial. In the mid 1800's the population of Santa Barbara, though still small, was greater than that of Los Angeles. Several fine painters were attracted to Santa Barbara and took up permanent residence. These included the venerable Henry Chapman Ford and later Alexander Harmer and his student Mary Stevens Fish. Of these early painters Sykes may have been the least trained and most amateurish. In a small city like early Santa Barbara there would have been a limited number of collectors. One can imagine that the finer homes had works by Harmer or Ford. The other collectors in this early village, or more likely early travelers to Santa Barbara, were fortunate to take home a painting by this early Santa Barbara painter, John Sykes.